Since today is Sunday, which is as good of a reason as any, and I love cats, which is also another great reason, I’m posting a video I found a while ago on the internet. It’s a funny video where two professional engineers (Paul and TJ) illustrate the proper care and practical benefits of cats. They use their own cats in the video (Paul’s cats, I believe): Oscar, Ginger, and Zoe. I have to say the tuna thing is so so true, as are many others in the video. 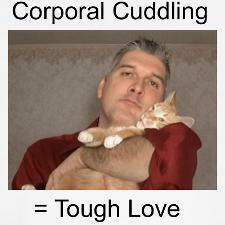 And yes, I do practice the corporal cuddling punishment. Usually I use it to punish them for looking too cute and cuddly. My cats love it! Just as much as any other cat does, of course. But that’s why it’s called tough love, right? Anyway, here’s the video. Hope you enjoy it. And if you’ve seen Monty Python and the Holy Grail, you have to watch this video they made: A reenactment of “The Coconut Scene.” With cats. Those two are just too funny. They have a YouTube channel where you can find links to their store and Facebook page as well as more videos featuring their cats, of course. Even a reenactment of one of the scenes from Princess Bride and a Cats of Christmas Past video featuring a steampunk laptop they built. So, do you have cats? 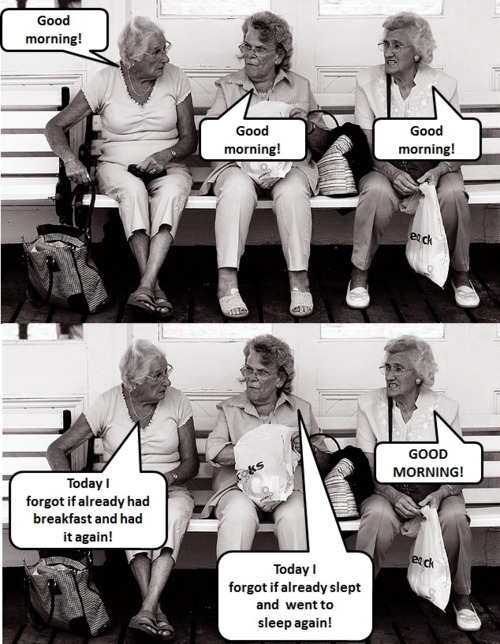 Forgetting: not just for old people anymore. A few years ago I accompanied my grandma to one of her lunches with her friends. My grandma was 76 at the time and all the other ladies were either 85 or 86. They said my grandma was the baby of the group, since she was so young. The lunch was very long, with each of them taking their time to chew their food and still manage to tell stories, but it was a great time. Mainly because of the stories, I didn’t care much about the chewing. One of them started complaining because her son wanted to hire a maid to help her out during the day. How dare he. She was incredibly upset about that. She said she told her son that was not an option, because if she didn’t have the work around the house to do, she wouldn’t have enough things to occupy her throughout the day. Then another one started talking about how she had a maid and she’d send the girl to wipe the leaves of her plants. She’d send the girl to the porch (apparently she had a lot of foliage there) and give the girl a tiny cloth to go wipe the plants. This way the girl wouldn’t bother her and she could cook as she pleased. I just remembered all of that because I was sitting on my couch and though “Something smells good,” and after a second I thought “My food!” and ran to the kitchen to rescue my lunch. Maybe it’s time for me to start putting a chair in front of the stove. I saw this post on Mike’s blog and it was just a title that didn’t say much and a video to click on. I couldn’t click on it right away so I just dismissed it, telling myself I’d watch it, eventually, but knowing that chances were I would never get a chance to. I’d forget, I’d get caught up on whatever it was that was important at the moment, you know, all the excuses we like to use on a daily basis. However, for some unknown reason, I remembered and went back to check the video. I’m glad I did. It’s about a 9 year old boy, who built an elaborate cardboard arcade inside his dad’s used auto part store, about to have the best day of his life.